Giving love to my lower back - Go Fit Girl! | Go Fit Girl! My friend Jen mentioned on Facebook yesterday that her lower back was bothering her after a ski outing. I recommended trying supported Bridge pose with a block. I have recurring low back pain. Probably due to over use, kyphosis and bad posture. So before every yoga class I do supported Bridge with a block. It is amazing how just a few minutes in this pose makes my back feel so much better. I was pretty busy today. So when I got to my morning Vinyasa class my back was throbbing. So for about 10 minutes before class started I put myself into supported Bridge pose. Near the end of class we practice Wheel pose. I skipped it and just did supported Bridge. Oh man, I was in heaven and was melting into it. After that we did savasana. I was ready for a nap when I got home. But there was too much to do. 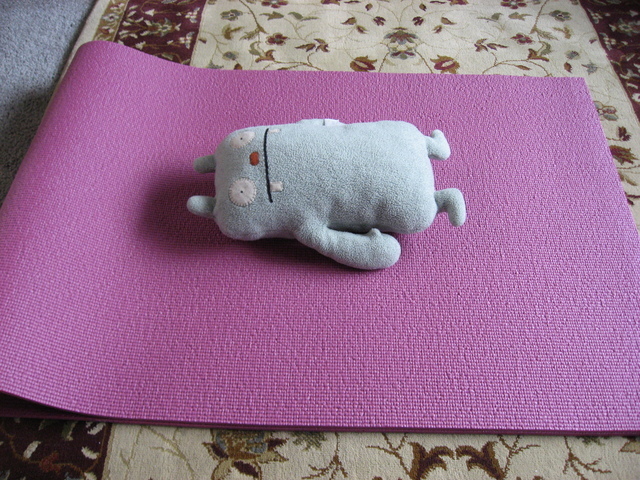 This evening I attended Restorative yoga class. I debated on if I should go since I wanted to nap. But I figured I could always nap during class. I also did supported Bridge before class started. A lot of the poses we did in class really helped relief my back pain. I am almost through Day 5 of my super cleanse. Yesterday our upstairs neighbors had a party. I was there for three hours and only had water. There was lots of good booze and oh man, amazing food. I had enough will power to not try anything. But I really wanted to. Right now I am having my green smoothie for dinner. And I have to say this is getting difficult. This is the first smoothie that has kinda put a speed bump in my journey. I will get through this. But it isn’t easy. After this smoothie I just have two days to go.